Our state-of-the-art CNC router enables us to efficiently and accurately cut, drill, engrave, and 3D-carve parts from woods, plastics, foams, and countless other materials with sizes as large as 48” x 96” up to 4” thick. 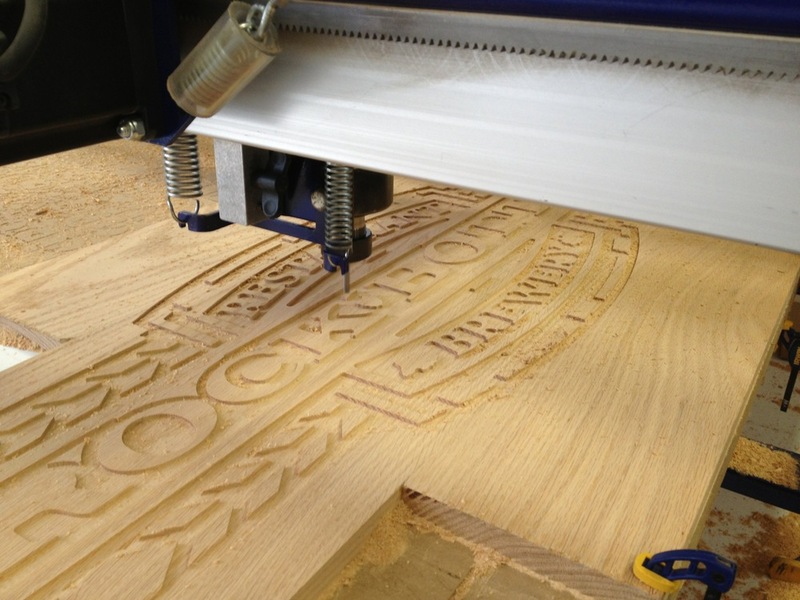 CNC routing is very versatile—the applications and material choices are virtually endless. Below is just a sampling of what can be accomplished. LR Design+Build operates both Mac and PC computers and utilizes several professional design software programs including; SolidWorks, SketchUp Pro, Rhino3D, vCarve Pro, Adobe Illustrator, and Photoshop. As a result we are able to cut your 2D or 3D parts with most any file format you may have. We can even convert digital photos into 3D relief carvings. To save setup time for most CNC parts we prefer to receive 2D plan view drawings in .DXF format. If your part requires depth pockets, slots, or partial drills please provide clear notes and/or side profile drawings of your requirements. For 3D carvings we prefer .STL or the native 3D program file. All files should have at least one dimension that we can use to check or adjust the scale. If you do not have a CAD file for your part or project, no problem, we can create one from a sketch or image that you have. There may be a charge for this service depending on the complexity of the parts. Draw all parts on the “Default” layer. If you are very organized and already have separate cutting functions on individual layers that is okay. Details such as part numbers, depth specs, or comments that are pertinent to the processing but not part of the detail can be put on a second “Details” layer. Remove / delete all other layers remove all fills and duplicated lines. Provide your files in their proper unit of measurement and at the full size you want them cut— 1:1 Scale in inches or millimeters. We prefer decimals over fractions, but we can work with both. Do not use block definitions. If you do explode them to simple vectors. Join all lines to form closed paths Leave enough space around each part in your file so that we can easily select them to create a layout for cutting. Let us layout or “nest” your parts for cutting on the machine. If you need them nested in a special way, like wood grain or texture orientation just let us know. If you have already created a layout for your parts to be cut take care to ensure there is enough space left between them. Around the perimeter leave at least 1.5” and at least 1” between each part. Be sure your drawing vectors are closed and for 3D carving that your meshes are “Water Tight” or “Manifold”. If you have ay questions let us know and we will do our best to help. Complexity and Size - The cost is based off of how long it takes to cut the part, so smaller intricate parts with many curves or corners may take longer to cut than larger basic parts with fewer details. Material Choice and Availability - Materials vary greatly in cost, availability, as well as how easy or difficult they are to cut. Easy quick jobs with a readily available cheap material have a lower cost that complicated parts cut from a expensive sheet of exotic imported material. We stock several types of common materials like MDF, Plywood, and Plastics. We can order most anything from our trusted material suppliers. Quantity and Volume - From a one-of-a-kind part to a repeating production run of thousands, the quantity and volume of of your order affects the cost. Design - If you do not have a design for your part and need one created we can can do that. The time required to create your design will affect the cost. File Preparation - Any time spent on prepping your files for cutting will affect the cost. It is most cost effective to prove nice, clean, and well organized files. See the section "Tips for Preparing Files" for more information. File Programming - Complex parts with several cutting functions and bit changes often take a decent amount of time to program which adds to the cost. Time Frame - We strive to turn around your parts in a timely manner, some parts require a rush which adds to the cost, while other parts are not needed quickly which allows us to add them to our production schedule when we are slow which can reduce the cost. Precision - The CNC router’s standard cuts are very accurate, however some parts may require a greater level of precision. This added precision is possible but may take cutting, tweaking, and recutting several parts before the desired accuracy is achieved, thus taking more time, adding more cost. Do I need to provide materials, or can you get them for me? - If you already have the materials, contact us to arrange a time for you to drop them off at our shop on the north side of Columbus, OH. We can also get the materials for you for an additional fee. Can you help me create the needed files from my sketch or source image? - Yes, LR Design+Build offers a wide range of design services, including design and engineering. Not all parts can be cut first try. Because of the extreme cutting forces required for CNC routing and inconsistencies in some materials it’s realistic to expect it will take one or two tries to create a production ready file developed for manufacturing. The CNC router can not do undercuts as it moves on three axes; (X axis) front/back, (Y axis) left/right, and (Z axis) up/down. It does not have the ability to tilt the cutting bit and can not do undercuts like a cave. It is more time consuming but we are able to do two sided cuts where we cut one side and manually flip the part over to cut the other side. We use registration marks and pins to get the alignment of the cuts within 1/16”, many times we can get the alignment precision to be much greater. The CNC router uses a round bit to make its profile cuts. As a result the internal corners of the cuts will have a radius equal to the radius of the cutting bit. However our router has the capability to clean-up the corners by recutting just the corners after the initial cut with a 1/8” diameter bit reducing the corner radius down to just 1/16”. Our programming software also has options to do “Bone Filleting” to the internal corners to help ensure parts cut from sheet materials will slot together after cutting. The 'Dog-Bone' and 'T-Bone' fillets allow tool paths to ‘notch’ the inside corners of slots and grooves, allowing mating parts to fit flush against the true base of the pocket. This technique allows the radius of the cutter to be removed from the bottom of slots. These filleting tools are perfect for designing and machining furniture, cabinets and model aircraft components etc. where a precision fit is needed. Contact us with your corner requirements and we can help to find a solution for your application. The CNC router can not cut hard materials like steel, stainless steel, glass, stone, concrete, etc. However we do have business relationships with other fabrication shops that can handle those hard materials and many more. 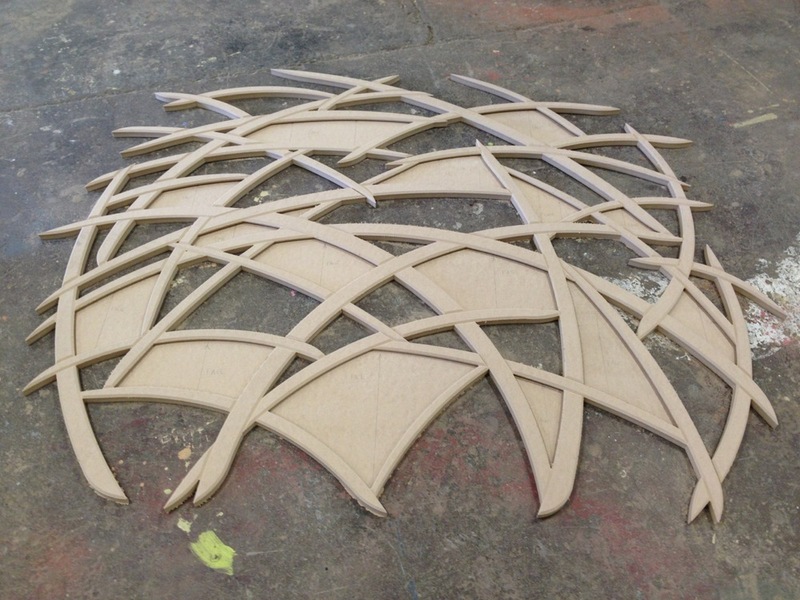 The CNC router does not cut very thin materials like paper, fabric, or thin plastic. Our laser cutting capabilities are better suited for that application. Because our CNC is equipped with a vacuum hold down we are able to cut some materials like high pressure laminate and plastic sheets as thin as 1/32”. Materials larger than 49” x 97” and over 2” thick for wood and over 4” thick for foam. Larger parts can be created by assembling several layers of material, or by using interlocking puzzle joints to precisely position and join the parts into larger pieces.